From Karen Gravina of North Bellmore, New York on 4/18/2018 . OMG....what a hit...will definitely purchase again and again...My brother who is a police officer in Farmingdale says he's always in your place. We want to come in and try your other treats soon!! From Anonymous of Bayville , New York on 3/18/2018 . From Pamela Wheeler of Brodnax, Virginia on 2/1/2018 . From Mary Clooney of Staten island, New York on 1/22/2018 . I ordered this bucket for my nephew in San Francisco who is unhappy with crumbs and crumbcake there.. He LOVED it and he is a crumb fanatic. From Anonymous of New York, New York on 1/16/2018 . This bucket only lasted a few days. They're irresistible! My only regret is not buying 2! From Barbara Darcy of Lynbrook, New York on 1/8/2018 . My son received the Bucket of Crumbs from his employer this year. It was my first encounter with them! I ordered them for myself and will now make it an annual Holiday tradition... Thank you for a wonderful product! From Glenn A of Dix Hills, New York on 1/8/2018 . Purchased for my In-laws. They flipped on how much they loved them. Wanted to know if I could get them this again - that says it all. By the way, don't tell them I stole a few before i gave to them. From Anonymous of Williamsburg, Virginia on 12/28/2017 . The Crumbs were put in a glass bowl on the Christmas dessert table. Shortly after that the positive comments started......but, the best ones came from the young children with a simple "These are so good" and then giggled when they asked for another crumb. They are fun. From Anonymous of Jackson, New Jersey on 12/27/2017 . Best holiday gift to bring to friends home for the holidays. From Trish S of Sayville, New York on 12/18/2017 . I got these "Bucket of Crumbs" years ago as a present. I thought it was one of the best gifts. Now I of course buy them for myself and enjoy but also give as gifts. From Joan Kopps of Marlboro, New Jersey on 12/13/2017 . When I was a little girl, my Aunt Frieda used to make the most delicious crumb coffee cake. Best part was the crumbs! When I first tasted Bucket of Crumbs, I was transported back in time. Thanks for the memories. Love it!! From Camille DeFillippo of Belen, New Mexico on 5/21/2017 . From Anonymous of Long Island, New York on 2/8/2017 . The most delicious treat ever! I can't stop eating them, we got a bucket for my office, but I want them only for me, I want to eat them all, absolutely love them!!! From Eva Norton of Miami Springs, Florida on 1/31/2017 . From Anonymous of West windsor, New Jersey on 1/24/2017 . Big mistake, HUGE MISTAKE, I ordered the big bucket and received the big can of crumbs less then a week ago. They are now GONE! Need I say more? Just wish shipping was lower. Also, you can hire my husband , a newly retired hedge fund guy to to be your sales rep in New Jersey. These crumbs need to be everywhere. So delish. From Anonymous of Washingtom, District of Columbia on 12/18/2016 . Someone gifted my office a Bucket of Crumbs. They are so good I can't keep my hand out of the bucket. My coworkers like them with coffee but I like tea -- and they're even great with water! I found out another coworker and I are responsible for eating the most, lol. From Kathy B. of Baldwin, New York on 12/17/2016 . Got a "Can of Crumbs" from a vendor as a gift...these are the bomb! I see myself making a trip to Hahns in the very near future! From Valerie of Staten Island, New York on 12/14/2016 . A Bucket of Crumbs was sent to my office for the holidays. They are INSANE, AWESOME, GREAT!! I then proceeded to send a bunch of buckets to friends/family and we all feel the same way..PERFECTION!! A must have!! From Arthur Iamele of Hilton Head, South Carolina on 8/14/2016 . Delicious and crunchy. Will try to make this last. From Linda of West Islip, New York on 4/23/2016 . I sent this this friend in Florida and everyone loved it. They thought it was a great gift and really loved the Crumbs!!! From RayC. of Bow, New Hampshire on 2/4/2016 . What a treat of tasty crumbs that we all enjoy for desert with ice cream, pudding or just a glass of milk ,tea or coffee. The best,thanks. From Anonymous of Shirley, New York on 12/23/2015 . From Anonymous of New York, New York on 12/22/2015 . This product is very yummy. Shipped in time for the holidays! From Maryann of Levittown, New York on 12/21/2015 . I have been purchasing bucket of crumbs since 2008. My friends and family LOVE them! Words can't describe how delicious they taste! They are simply amazing! From Celeste of Fairfax Station, Virginia on 12/16/2015 . I sent a bucket of crumbs to my son to enjoy while he is studying for his final exams at VA Tech. His roommates and he are enjoying it immensely. They cannot believe how much is in the bucket!! Who doesn't LOVE your crumbs. I have ordered these for the last several years and have never been disappointed !! Your crumbs are so fresh and I don't have to pick all the crumbs off the cake before my family gets theirs :0).Keep making this amazing treat !! From martha cummings of TOMS RIVER, New Jersey on 12/15/2015 . I received a bucket of crumbs last year at the office and everyone flipped over them. What a great concept, So I sent them this year to my Aunt who is known for picking the crumbs off of our cakes. She was in heaven! As soon as you open the can, the aroma is amazing. the crumbs were so fresh. Thank you for a great product! Must Get These Crumbs Best Gift Ever! From Maureen of Queens, New York on 11/12/2015 . If you are one of those people who loves to pick the crumbs off your coffee cake, than this treat is for you!!! The Best crumbs you will ever taste is right here in this bucket! Have been purchasing these for over 4 years now for Christmas Gifts and had a bucket sent to my Aunt in Pennsylvania who is a crumb critic and She loved them too! Great Gift to give or get!!! Highly Recommend! Oh my, my, my! I have no words to explain how delicious these crumbs are!!! Just love these crumbs. Revived them as a gift a few years ago and now I send them to everyone I know as a special treat. Then they order themselves cause they love them too. From Jeff Miller of Lanexa, Virginia on 2/14/2015 . The crumbs are good. They are a little more solid than what is on a crumbcake. I like the crunchy texture and the flavor is excellent. We saw the ad on WAMU and clicked through, glad we did. From Dennis Morisette of Mokena, Illinois on 1/14/2015 . WOW!! Are these great! I find myself rationing them so they will last longer but I know that won't work. Will have to order more. From Joseph Correia of Spring, Texas on 12/29/2014 . From George Dormani of Rockville Centre, New York on 12/29/2014 . We Love The Crumbs, I sent them to 36 of my customers, and they are still raving about them a week later!!!! From Anonymous of Easton, Maryland on 12/22/2014 . A big hit with kids. From MANETTE DEROSA of Shoreham, New York on 12/20/2014 . We had received bucket of crumbs last years in our office as a gift from a vendor. They were amazing that I had to order these as gifts to give out this year. I am ordering some more for additional gifts to be mailed to my relatives. From Anonymous of Queens,, New York on 12/18/2014 . You have to eat them to believe how good they are. From Mary Ford of Mahopac, New York on 11/7/2014 . The bucket of crumbs is the greatest invention ever - our kids always eat the crumbs off the crumb cake and leave the "bread" (as they call it) for someone else. 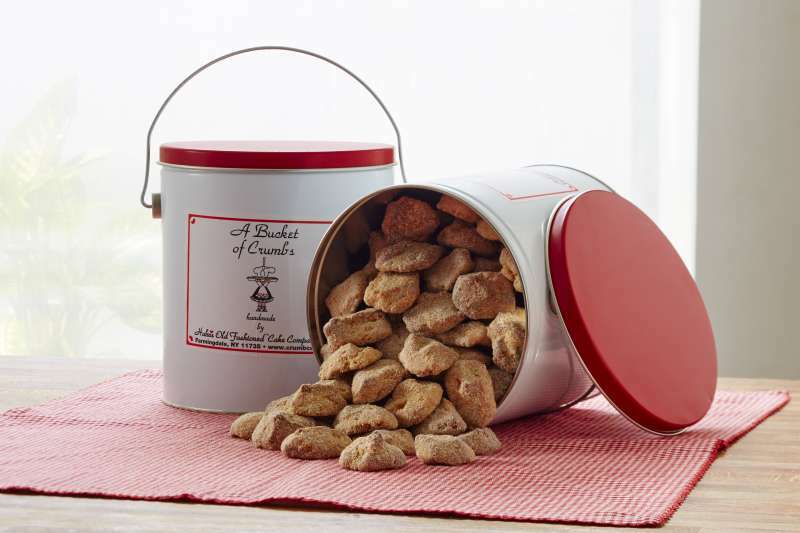 The bucket of crumbs satisfies their craving and we now get to enjoy the entire crumb cake! The crumbs are always fresh and delicious. From Carol of Deer Park, New York on 7/10/2014 . I tried these at a friends house, took a picture of the bucket, and went ahead and ordered them. They are amazing. Great to put out for a snack for a few people or just with coffee or whatever. They are delicious. Love them. From Odessa Taft of Madison, Connecticut on 4/13/2014 . Nothing crumby about this cake. The Best Crumb Cake Ever! I absolutely love crumb cake, my favorite cake. From Margaret A Ural of Bradenton, Florida on 3/26/2014 . Nothing says home like a NEW YORK crumb cake. And a Bucket of Crumbs saves the day from those constant "pickers". Smiles everywhere!! From Anonymous of North Brunswick, New Jersey on 2/9/2014 . Love the Bucket of Crumbs! If you love crumb cake, and your favorite part is the crumbs on top, this is a must purchase! From Kimberly Meier of Elk Grove Village, Illinois on 12/17/2013 . For years my family's Christmas morning included a Hahn's Old Fashioned Coffee Cake that was purchased from Market Day. About 5 years ago they stopped carrying them. Today I found the bakery on-line and my family will be so excited and surprised as our Christmas tradition will be brought back to us. These coffee cakes are the best I have ever had and we will relish every bite. I plan on ordering a bucket full of crumbs to hide just for myself!! From Debbie Graziosi of Kearny, New Jersey on 9/4/2013 . I have never given a gift to someone that has provided as much joy as a bucket of crumbs from Hahn's! I have given a good friend this gift on two separate occasions and each time she has been thrilled with the bucket. Thank you for bringing love in a bucket! From JEAN JONES of CRANFORD, New Jersey on 8/30/2013 . I have received on 2 occasions the delicious Bucket of Crumbs as gifts. One was a part of a retirement gift and the other was a get well/thinking of you gift. I absolutely loved the crumbs and they made a fantastic gift!!! Thank you for making such a DELICIOUS product!!!! I have received your Bucket of Crumbs as a gift on 2 occasions. They are the most DELICIOUS CRUMBS that I have ever tasted!!!! I received them as part of a retirement gift and also as a part of a get well/thinking of you gift. I was thrilled and enjoyed both of these gifts so much!!!! They are FANTASTIC!!! Thank you for such a wonderful product!!! !